Would you like access to dozens of additional form templates? 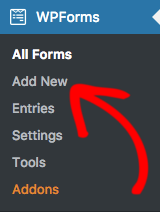 Form templates make building forms faster by starting you off with relevant fields, and now we have even more template options. In this tutorial, we’ll discuss how to install and use our Form Templates Pack addon so you can access many more template choices. Requirements: You will need a Pro license level or higher to access the Form Templates Pack addon. Before we get started, be sure you have installed and activated WPForms. Then, you can go ahead and install the Form Templates Pack addon. Once the Templates Pack Addon is installed and activated, no other setup is required. 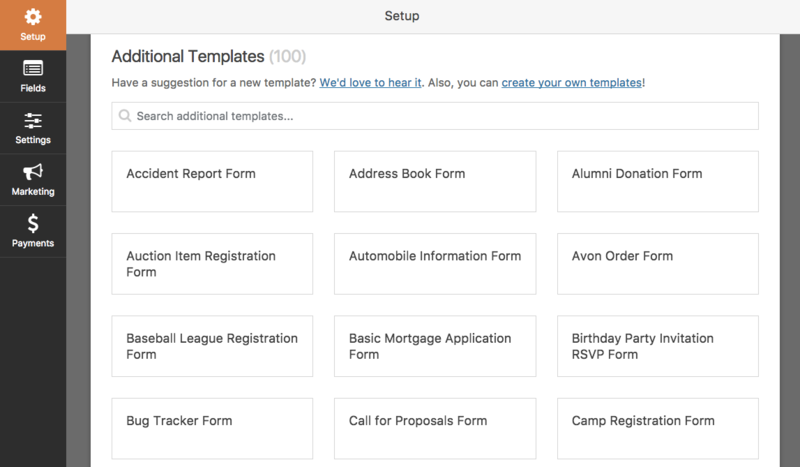 To view these new template options, you can go to WPForms » Add New. Selecting the Add New option will open the form builder’s template selection screen. The top portion of this screen will contain our standard template selection, but if you scroll down you’ll see a section titled Additional Templates. All template titles are visible in this section by scrolling. The search bar can also be used to narrow the options and find the template you need quickly. Clicking on any template title will load the template, and from there you can customize the form in any way you like. That’s it! You now have access to dozens of additional form templates. Would you also like to learn more about setting up automatic email notifications for your forms? We have everything you need to get started in this tutorial. Fixed: Typos and grammar issues.